Bangalore is a city where people from different places, different cultures, different religions and classes live together in harmony. Being a metro city, the number of those who come here to settle is increasing day by day. The flourishing IT and other industries too are a major reason for this change. When your weekdays are packed with assignments and deadlines, how good would it be to spend a weekend travelling? Bangalore has several places near it that can be visited over a weekend. The ideal location of the city makes it easy to access several popular and unexplored tourist destinations near it. Melukote, the birthplace of the former CM of Tamil Nadu, late Jayalalithaa, is one of the places you can visit from the city over a weekend. Let us take a road trip from Bangalore to Melkote. There are two popular routes that can take you from Bangalore to Melkote. This route takes you to Melukote via NH75 and NH150A. This route is taken via NH275 and has some beautiful places to visit on the way. Let us take this route and take a trip from Bangalore to Melukote. Read More : The Sugar Land Of Karnataka - Mandya! Since you have to cover around 160 km and also stop at various places for sightseeing and refreshments, it is better to start the journey early in the morning, so that you have time to enjoy the places on the way, without worrying about rushing through the places that demand some of your time. Once you start your journey early morning, you can stop by for breakfast at Kamat's Palate Korner or Kudla Restaurant for some sumptuous South Indian dishes. The other eateries around include Spice It, Srivari Veg Fast Food and KBR Fast Food. After breakfast, the next stop is at Ramanagar, which is around 54 km from the city. This place became famous after the superhit Bollywood film Sholay was shot here. As it is a trekking destination, you may enjoy the views of the area, click some photos and head to the next place, which is Madduru. Madduru is located around 35 km from Ramanagara. Madduru is a place that has a history dating back to the times of the Mahabharata. Legend has it that as the Dwapara Yuga came to an end, Arjuna of the Pandavas wished to see Lord Krishna in his Narasimha avatar. Following Lord Krishna's refusal, Lord Brahma created an idol for Arjuna to worship. This fierce Ugra Narasimha idol is worshipped in the Ugra Narasimha Temple in Madduru. After your darshan at the temple, the next destination on the way is Mandya which is around 18 km from Madduru. Mandya is fondly called 'Sakkare Nadu' for its sugar factories. 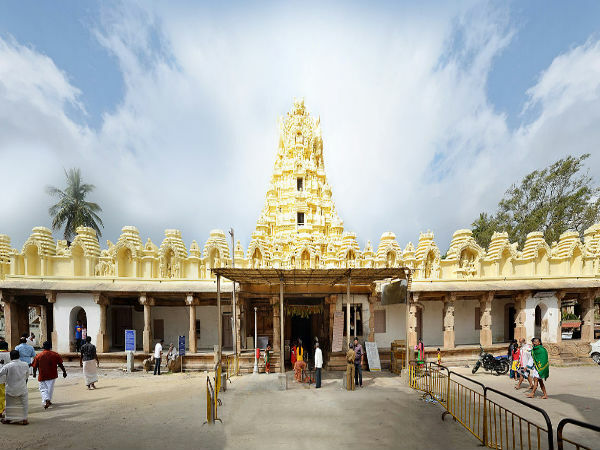 Sri Varadaraja Swami Temple and Sri Pattabhirama Temple are two significant temples in Mandya. Yoga Narasimha Swamy temple is located atop the hillock Yadugiri. Built during the Hoysala reign, the temple tower can be seen from a distance. The temple is dedicated to Lord Yoga Narasimha, and it is believed that the idol was installed by Prahlada, the son of Hiranyakashapu. This temple is considered as one of the seven significant Narasimha temples. This temple is also on the Yadugiri hill. The shrine is believed to be from the ancient times, and the temple is dedicated to Lord Vishnu. The Cheluvanarayana Temple is one of the significant pilgrimage sites of the Sri Vaishnava community. It is believed that Lord Rama came here with his son Kusha and worshipped Lord Narayana. The idol here is known as Sampath Kumaraand also called Ramapriya. The Goddess worshipped here is called Yadugiri Nachiyar. Raya Gopura is one of the attractions that would interest history lovers. It's an incomplete structure of a temple that was built during the reign of Vijayanagara empire. Believed to have been built overnight, the temple has 4 intricate carvings, with no temple tower. The place has been shot in several South Indian and Bollywood films as well. The Thondanur Lake here is believed to be built by Swami Ramanuja, who had lived in the region. The lake is surrounded by the Padmagiri hillock, Tipu caves and a waterfall named Ramanuja Gange. The lake is said to have medicinal properties. It is also interesting to know that once when Tipu Sultan visited the lake, he found the water crystal so clear that he fondly called the Lake 'Moti Talab' which means the 'Lake of Pearls'. This ashram was established by ISKCON in 2010. It is a preaching centre, which also serves a Vedic old age home. If you are planning for an overnight stay at Melkote, Mandayam Srivaishnava Sabha offers reasonably good accommodation for pilgrims. For hotels and resorts that offer better facilities, you may have to go to Mysore road. Some good stay options here are Amblee Holiday Resort and Hotel Le Ruchi, The Prince and Hotel Mayura Riverview.